In update 1.55 “Royal Armour” we introduced new game mechanics - Battle tasks, these individual tasks bring variety into the gameplay and prevent situations when all the players in a battle try to complete one certain tasks ignoring mission objectives needed for a victory. A player doesn’t have to earn, purchase or unlock battle tasks- they are available to all players who have rank 3 vehicles from any nation in a special menu included in the game. A player may receive tasks from 3 levels of difficulty. Initially a player will be given 2 easy tasks for ground battles and 2 for air battles (for Arcade and Realistic mode). After completing at least one easy task he will receive the prize and the remaining tasks will be replaced with new ones, of medium difficulty. After completing one of those the player will have access to difficult tasks. Only 3 tasks can be completed per day - one easy, one medium and one difficult. If you don’t like the suggested Battle Task you can change it for a designated amount of Silver Lions. The more often you change tasks, the more it will cost in Silver Lions, after a specific number of changes in a day they will become available for Golden Eagles only - so choose carefully. For completing Battle Tasks you will receive Silver Lions and a new in-game currency - War bonds. War bonds may be spent to purchase specific items available only for War Bonds. War bonds should be spent within a month, you will be able to buy a variety of items - they will be changed each month as well as types of War Bonds that can be used for purchase - so don't hesitate to spend them! You can claim your reward right after you complete a Battle Task. Please note that it is not done automatically - you should select the reward manually using a specific button press. That’s not all! 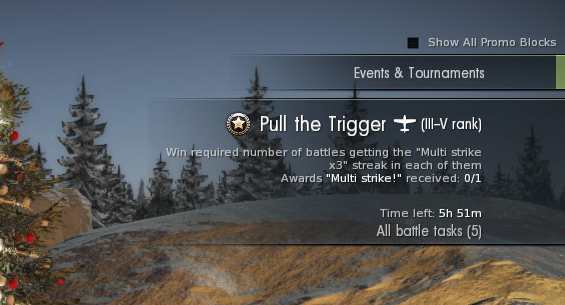 During days when specials are available in War Thunder, these mechanics will make it easier for you to find current tasks and to follow your progress and time required to complete them. We are confident that the “Battle Tasks” included with update 1.55 will provide more interesting ways to achieve victories for all our War Thunder players. Good luck!